Our first booking of the season back in September was Maz and Sherv’s festival wedding weekend set in a beautiful location on the edge of the Otway’s. Maz and Sherv’s got engaged and set the date for 6 weeks later! 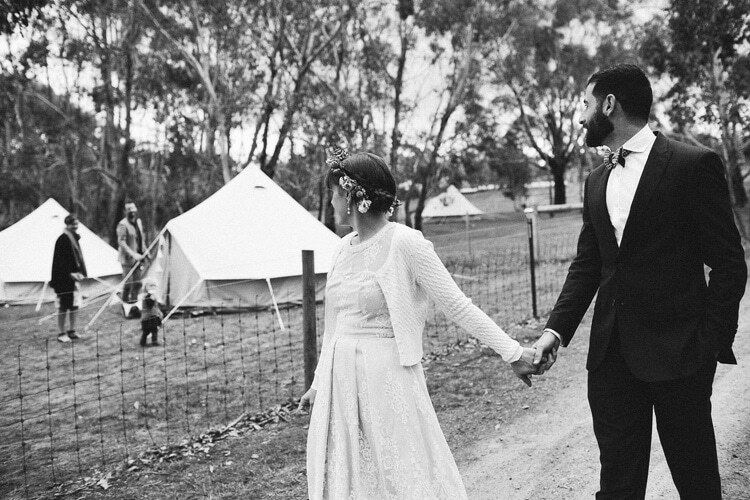 This might sound a little bit insane to some people but to Maz and Sherv’s 6 weeks was plenty of time to organise the relaxed Otway’s wedding they dreamed of, ‘why drag out the planning’ they say! We were so excited to be there to see the glamping village coming together at our friends beautiful property in Bambra, on the edge of the Otways. Late into Friday afternoon our friends and family began arriving and settling into their weekend homes. A camp fire was lit, cups of tea were made and children roamed the paddock with beanies on heads and footballs in hands. The community atmosphere we had imagined wrapped around us like a giant hug. Saturday brought with it sunshine and blue skies, at least for the morning. Our guests made use of portable showers and a decked out dressing tent, as we spent the morning getting ready with our families. We wandered down in the early afternoon with the wonderful photographers from ‘its beautiful here’ and frolicked with friends, family and farm animals before we headed to the ceremony site, deep in the forest to be wedded. We partied on into the evening at the Deans Marsh Community Hall, returning only when dessert was finished and our feet were sore from dancing. We walked back to our bridal tent by torch light and slept under the stars. It was so lovely to be able to share this time with our loved ones, in such a beautiful place, with warm beds and all the luxuries of home. The glamping village was mix 4 metre and 5 metre bell tents sleeping 60 guests in total – couples, groups of friends and families. We also transformed one of our 5 metre bell tents into dressing room for ladies, complete with full length mirrors, dressing table, hairdryer and GHD straighteners.